There are only two things to know about making muffins. The first is that the mixture should not be over-stirred; it should look coarse and rather lumpy. The second is that they must be made and eaten on the same day. 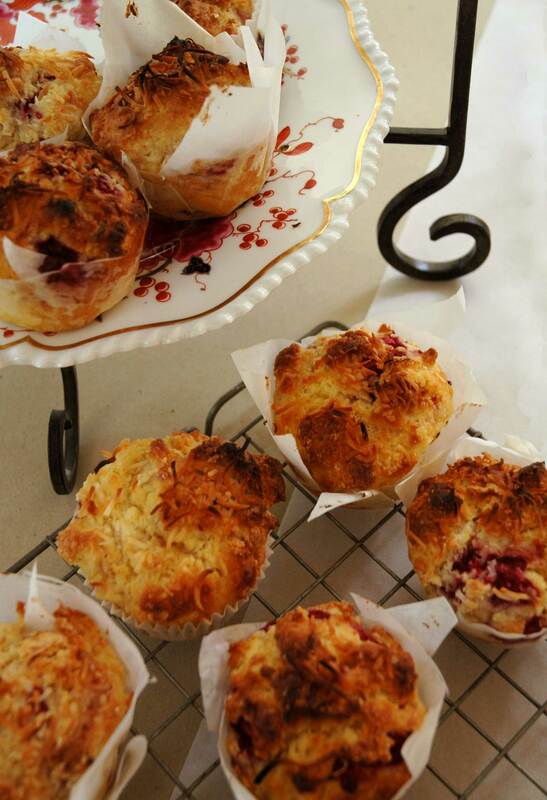 Muffins are the perfect pocket-breakfast. Take one with you as you hurry out the door. Maybe the reason you’re in a rush is because you rose half an hour early to bake a batch of muffins from scratch. Still, they’re out of the oven now, and on a wintry morning they will warm your hands as you leg it to the bus stop. There are hundreds of recipes, but this one is my favourite. The raspberries are sharp little flavour bombs, while the two kinds of coconut, lightly toasted, are a taste I associate with summer. You Will Need: 2 1/2 cups (375g) self raising flour, 90 g butter chopped, 1 cup (220g) caster sugar, 1 1/4 cups (310ml) buttermilk, 1 egg beaten lightly, 1/2 cup (30g) dessicated coconut, 150g fresh or frozen raspberries, 2 tablespoons shred ded coconut. And Now: rub the chopped butter into the flour with your fingertips, add sugar, buttermilk, egg, dessicated coconut and raspberries. Mix until just combined. Divide mixture into a 12 hole muffin pan, greased if not your are not using liners, and sprinkle the tops with shredded coconut. Bake for around 20 minutes in a moderately hot oven. Stand for a few minutes before turning out onto a wire rack. That’s it, the entire raspberry coconut muffin story. Nothing left to do, but enjoy. 19 Jul	This entry was published on July 19, 2012 at 12:11 am. It’s filed under Uncategorized and tagged beautiful breakfasts, breakfast, creative writing, food, food writing, muffins, pocket-breakfast, raspberries, raspberry coconut muffins. Bookmark the permalink. Follow any comments here with the RSS feed for this post.